Ah, the Boogie Man is out and about! I'll be sure to lock my door tonight and behave myself! Great shadow shot for the day! Enjoy your weekend! 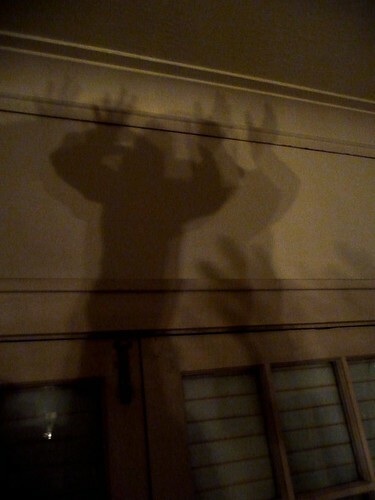 Spooky ;) Great shadow shot! cool shot..who is that scary menace?? haha and yes there is a whole st devoted to selling bicycles in Mexico city - combined with hookers...go figure!! Missed Halloween by that much! I think you and your multiple shadows are having way too much fun!!! Keep havin' it!!! Looks like someone was feeling pretty silly! Great shadow! Kinda' scary! But I like the original take on the shadow theme. I think it's a spooky looking shadwo. Scary!!! looks like an indie goddess with all the arms and hand? He he... spooky... but this is really awesome shot!